Generating antiphase PWM signals with the dsPIC30F4011 | ad hocumentation • n. fast, instinctive documentation of ideas and solutions. I frequently receive queries from people who are using a dsPIC microcontroller to control power electronics of some kind, such as in an inverter, a voltage converter, or similar. Many of these queries relate to the generation of different combinations of pulse-width modulation (PWM) signals. In this article, I describe a simple example application in which the dsPIC30F4011 is used to generate two antiphase PWM signals with duty cycle varying between 10% and 45%. By antiphase, I mean that the two signals are 180 degrees (π radians) out of phase with each other. Apart from that, the two signals are identical. I developed this example in response to a query from gunz which was posted as a comment on another article that I published on this blog a couple of years ago. In that article, I also generated antiphase PWM signals, but I used two of the dsPIC30F4011’s three PWM channels. Specifically, the signals were generated on pins PWM1H and PWM2L. 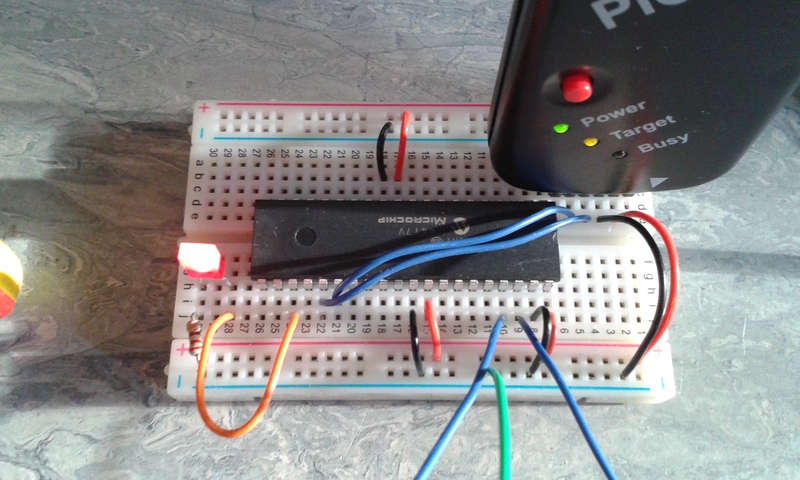 Gunz asked how to generate the signals on the high and low pins of a single PWM channel (e.g. PWM1H and PWM1L), so that’s what I’m demonstrating in this example. 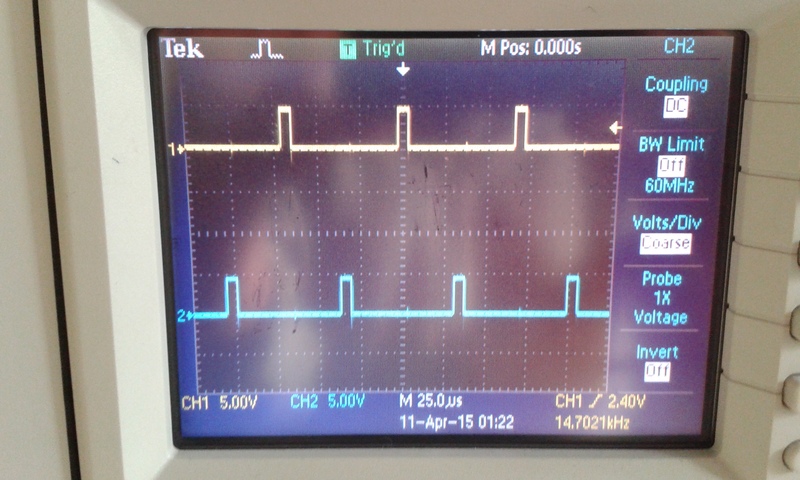 Two identical PWM signals 180 degrees out of phase. The PWM frequency is 15kHz. The duty cycle varies between 10% and 45% (hence the pulses on the two outputs never overlap). The output pins are PWM1H and PWM1L. // between 0.1 and 0.45. PWM frequency is constant at 15kHz. // in turns to output pulses. // of the the next cycle. // Alternate between overriding PWM1L and overriding PWM1H. // the next PWM period, suppressing its output pulse. // when PDC1 = PTPER, the PWM1 duty cycle is actually only 50%. // half of the full signal period. Yes, it's potentially confusing! I downloaded the file “a.hex” onto the dsPIC30F4011 using a PICkit 2 USB programmer. I don’t use MPLAB at all, so I just used the PICkit 2 software application (V 2.61 can be downloaded here). The breadboard circuit I used for testing is shown below. In addition to the voltage supply connections I included in my circuit, I highly recommend connecting pin 20 (VSS) and pin 21 (VDD) to the voltage supply rails. In the past, I have tended not to bother connecting all voltage supply pins, but I have recently run into some very strange problems that it took me a long time to realise could be completely solved by connecting more voltage supply pins. Specifically, I had a lot of problems with mysterious resetting of the dsPIC when using PWM interrupts in parallel with mainline code (such as the LED flashing code I put in the main function in this example). I therefore highly recommend connecting all of the dsPIC’s voltage supply pins, even if it seems redundant. An indicator LED (with 220\Omega; current-limiting resistor in series) is connected to RD0 (pin 23). The three wires which extend beyond the lower edge of the image are the oscilloscope connections – green is ground and the two blue wires connect PWM1H and PWM1L to different channels of the scope. This is how the circuit appeared once the code shown above was running. The LED on RD0 simply blinks on and off once a second. I displayed the signals from PWM1H and PWM1L on the two channels of an oscilloscope. As shown below, the two signals are identical but 180 degrees out of phase. The following modified version of the previous example shows how the PWM ISR can be used to update the duty cycle as well as alternating the generated pulses between the two outputs. Apart from comments, the only change from the previous example is the addition of lines 62-68 to the PWM ISR (the _PWMInterrupt function) which modulate the PWM duty cycle. // and over again. PWM frequency is constant at 15kHz. // duty cycle reaches 45%, it is reset to 10%. Here’s a short video showing the sawtooth modulation of the PWM duty cycle displayed on the oscilloscope. This entry was posted in Uncategorized and tagged antiphase, C, dsPIC, dsPIC30F, dsPIC30F4011, duty cycle, example, interrupt, oscilloscope, OSYNC, out of phase, PDC1, PICkit 2, PTPER, pulse-width modulation, PWM, PWM1H, PWM1L, sawtooth, sawtooth wave, simple example, tutorial, XC16, _POUT1H, _POUT1L, _POVD1H, _POVD1L, _PTCKPS, _PWMIE, _PWMIF, _PWMInterrupt. Bookmark the permalink. 1. Such a pity the power supply issue is not in the microchip documentation. …in which the most consistent advice seems to be to always connect every available power pin. I think I’ll do that from now on anyway.